While some sources cite Mitchell & Rammelsberg’s beginning as 1847, an excerpt from 1875 Kenny’s Illustrated Cincinnati indicates the business was established in 1836. Regardless of the date this company began doing business in Cincinnati, Ohio, it is widely regarded as one of the premier manufacturers of Victorian-era furniture, and it was purportedly the largest of its time, according to Kenny’s. The size of this furniture business, and their use of advanced manufacturing techniques, was quite a feat for a company working outside Grand Rapids, Michigan, the furniture center of the United States at this time. The popularity of the Mitchell & Rammelsberg brand grew when the company exhibited at the Philadelphia Centennial Exposition in 1876. After producing high-quality home furnishings that were both beautifully crafted and functional for several decades, the firm became The Robert Mitchell Furniture Company in 1881. The newly named operation continued making furniture until 1940, according to information provided by wikicollecting.org. Many pieces of furniture made by this fine manufacturer are indeed marked. For instance, bed connectors may be marked “M & R” or one drawer in a set may be stamped Mitchell & Rammelsberg inside. Carefully checking each piece in a set, and each component of every piece is imperative to avoid overlooking a mark. Identification is more difficult when sets are split up and not all pieces were marked. This happens over time when families divide estates or dealers sell offsets they acquire piece by piece. When a mark isn’t present, looking at the quality of the wood, carving details, and the types of decorative embellishments may indicate a Mitchell & Rammelsberg piece. A number of different styles popular in the Victorian era were produced by this meticulous firm including Neoclassical, Rococo Revival, Renaissance Revival, Queen Anne Revival, Egyptian Revival and even those with a Japanese influence. They most often used top quality mahogany, rosewood, and walnut woods. The carving on these pieces, including high relief animals and fruit motifs, will be top notch as well. Museum-quality pieces have also been noted as having ivory drawer pulls and onyx embellishments. Among the items made by Mitchell & Rammelsberg in the mid-1880s were bedroom suites including bed frames and dressers, dining sets with matching sideboards, desks, sofas, hall trees, and occasional tables. The bedroom sets made of mahogany and rosewood with multiple matching pieces featuring elaborate carving or other embellishments demand top dollar with today’s collectors. Although demand for elaborate Victorian furniture has cooled somewhat overall compared to demand in past decades, these high-end pieces still command thousands when they occasionally come up for sale. 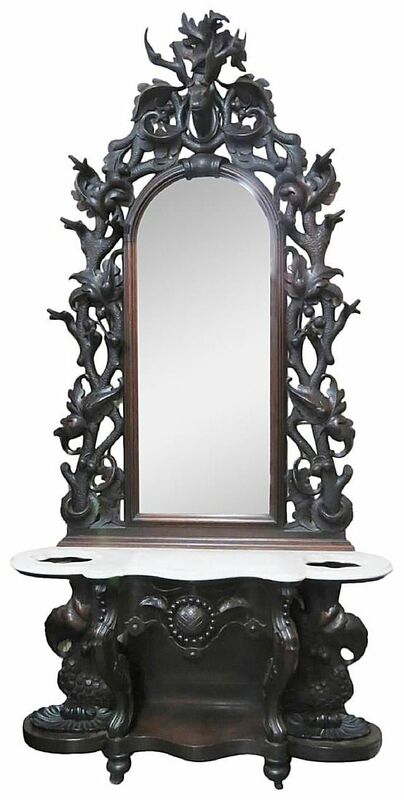 Walnut pieces, by and large, are less valuable unless very elaborately carved and decorated. The number of pieces in a set, quality of the wood, and overall decoration determine how much bidders and buyers are willing to spend. It is also important to verify that an unmarked piece was actually made by Mitchell & Rammelsberg before paying top dollar for it. Not all the carving details and decorative elements used on these pieces were not completely unique, so take care not to confuse them with the work of other companies doing business in the late 1800s like R.J. Horner & Co.